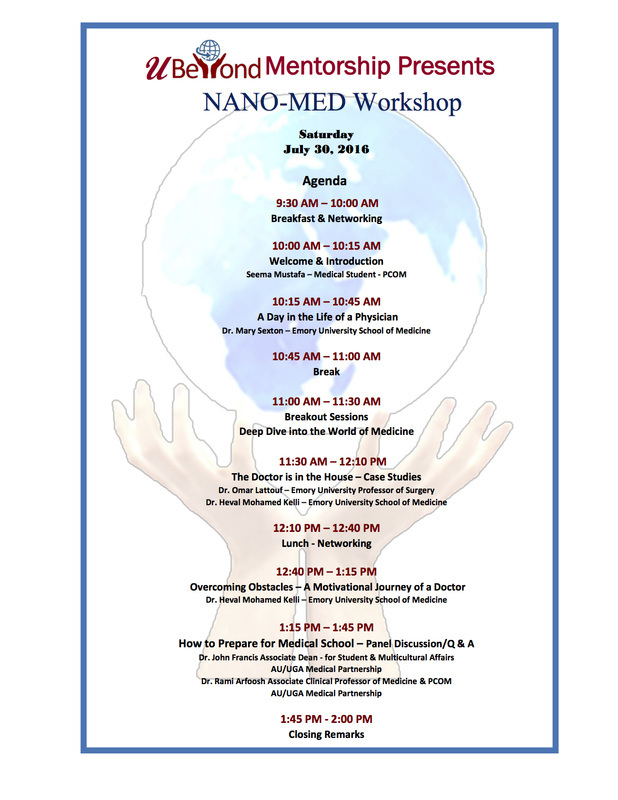 ​​With over 50 participants, including an audience filled with future physicians and our internationally acclaimed speakers, the U-Beyond Nano Medical School Workshop held on Saturday, July 30th was a great success! Attendees were inspired by talks from U-Beyond members, Omar Lattouf, MD and Heval Kelli, MD, who also put these future medical doctors to the test when they were challenged to "think like a physician" during an interactive and lively case study presentation. Mary Elizabeth Sexton, MD guided attendees on how to begin a career in medicine with balance, discussed what it means to be a doctor, and provided an overview on a day in the life of a physician. John Francis, MD, PhD, Associate Professor of Medicine at the AU/UGA Partnership, provided tips on applying to medical school, test taking advice, and the medical school curriculum structure. U-Beyond member, Rami Arfoosh, MD led the panel discussion on medical school requirements and what these schools are looking for in medical school student candidates. This workshop could not have been possible without the help of U-Beyond members Seema Mustafa, who, with Heval Kelli, MD, developed the program, MC'd the event, and is on her way to medical school this fall; Najah Abukhdeir, who managed on-site registration and the delicious food at the event; Emad Sabbah, who made sure there was a seat for everyone who attended; and Patricia Sneddon who produced the on-site materials and certificates of completion for all attendees! We would also like to thank our gracious hosts Ali Katoot, Crystal Carroll, and Patrick Kelly at MK Industries who allowed us to use their venue!